New security threats are emerging all the time, from new forms of malware and web application exploits that target code vulnerabilities to attacks that rely on social engineering. Defending against these risks is an ongoing battle. In response, the array of security technologies available has also grown. While we are familiar with essential defenses such as network firewalls and antivirus software, more sophisticated solutions are harder to evaluate. Intrusion detection, SIEM, Web application firewalls—which are right for your organization, and how do they work together to prevent data breaches, downtime and the business consequences of a successful attack? 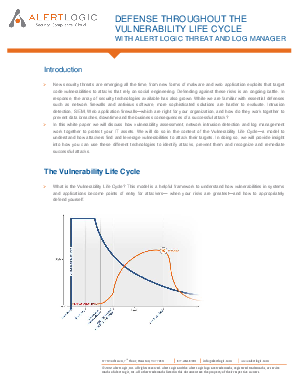 In this white paper we will discuss how vulnerability assessment, network intrusion detection and log management work together to protect your IT assets. We will do so in the context of the Vulnerability Life Cycle—a model to understand how attackers find and leverage vulnerabilities to attack their targets. In doing so, we will provide insight into how you can use these different technologies to identify attacks, prevent them and recognize and re mediate successful attacks.